Over the last few years, there has been a marked shift in consumers’ demand for used cars. When it comes to making major purchases, they are generally much more cautious about value, which in turn has made them more inclined towards used cars than first-hand ones. More consumers now believe that they will get more value-for-money if they settle for a second hand car. In fact, in many cases, it is being observed that pre-owned luxury cars have also become status symbols. If your goal is to save money, buying used cars in Delhi can save you big bucks in more ways than one. While paying a lower purchase price for the same car model used rather than new is the most obvious reason to buy a used car, there are other reasons as well. However, it is crucial for a consumer to do his homework before deciding if a used car is in good enough shape. With the “right” used car, it is possible for an owner to buy it, drive it, and sell it with little loss in equity. It is also interesting to note that since second hand cars in Delhi have less value as compared to their newer versions, the cost of insurance should be less. Consequently, you can save even more money because some elements of insurance can be given a miss. Of course, getting more bang for your buck is a major incentive behind the rising popularity of the used car market all over the country, including the capital city, Delhi. You may not be able to afford that new luxury car you crave for, but one that is two or three years old may fit your budget. In fact, since carmakers redesigning their models every year is a thing of the passé, buying a used model is nowadays free of the stigma that it was once accompanied by. If you are truly worried about a car’s potential hidden problems, you can also buy a certified pre-owned car. First launched in 2015, the Renault Kwid has retained its popularity over the years, thanks to its crossover-ish design and a decent set of features at an affordable price. It is one of the most popular choices amongst buyers of pre-owned cars in Delhi. > It is powered by an 800cc, 3-cylinder petrol unit that generates 53bhp of maximum power against a peak torque of 72Nm. It additionally comes with a 1.0litre unit which churns out 67bhp with the torque output being 91Nm. While the 5-speed manual gearbox is standard across both the engines, the Easy-R AMT unit is offered only with the 1.0litre engine. > The claimed mileage for the 800cc powered variant with a manual transmission according to ARAI certification is 25.17kmpl. On the other hand, the 1.0litre unit delivers 24.04kmpl in standard conditions. > The car is equipped with safety features like, updates seat belts with pre-tensioners and load limiters for the rear seats. Besides, you can also expect airbags, engine immobilizer, and central locking. However, it gives a miss to ABS and EBD, being a budget car. > As far as braking is concerned, it uses disc brakes at the front axle and drum brakes at the rear axle. Initially, the engine feels somewhat sluggish, though it soon picks the pace. Ride quality is also quite decent, thanks to the suspension set-up that works in favour of Kwid, also minimizing body roll. > When it comes to the exterior, the square-shaped SUV-like stance can give other hatchback-based crossovers a run for their money. Dimensionally, the Kwid is the largest amongst its rivals, with also a decent ground clearance. The aggressive front profile is accentuated by the C-shaped signature headlamps and the front grille with a bold structure. The lower bumper is graced by chunky fog lamp housings. Body cladding on the wheel arch and thick black side panels lend a rugged look to the side profile. The rear profile too, flaunts an impressive look, featuring integrated roof spoiler and distinctively designed tail lights. The 1.0litre version is more or less the same as the 800cc variant, barring the chequered flag pattern on the side decals, slightly larger ORVMs with dual tone colour and SCe badge on the tailgate. > Kwid offers generous space in terms of this cabin for both its front as well as rear occupants. However, the thigh support is not that good. The dashboard and the instrument cluster have been carved contemporarily.The cabin gets dual glove-box and cup holders along with other cubby holes, thus promising ample storage space. Talking about entertainment, buyers can expect a MediaNAV with segment-first seven-inch touch-screen infotainment display and roof mic exclusive to the top-spec variant, Bluetooth audio streaming and hands-free telephony, USB port, AUX-in port and a 12V power socket, amongst others. Power windows available only in the front. Also, on the high-end trims get the board trip meter, rear parcel tray, cabin lighting with timer and fade out function, and electric power steering. The market is always raging after automatic hatchbacks, and Datsun, in an attempt to carve out its own niche in this up-and-coming segment, has introduced the RediGO which is an automated manual version of the standard 1-litre model. It has managed to hold its own ground amidst an array of budget hatchbacks, with its cohesive design, compact dimensions and the decent set of features. > It is powered by a 799cc, 3-cylinder ISAT petrol engine that is tuned to produce 53bhp at 5678rpm and 72Nm at 4286rpm. It is mated to a five-speed manual transmission unit. > As far as safety features are concerned, this car promises driver side airbag as a standard offering on the top-spec variant, though the rest of the line-up gives it a miss.Besides, the hatchback also gets three-point seatbelts in the front and the rear, two point seat belts in the rear central, rear door child safety lock, and engine immobilizer. > Braking force is not up to the mark, and even the anti-lock braking system is also missing from the model, which is a drawback. > Coming to the exterior, the tallboy design philosophy works in favour of the small car. Its front facade is styled aggressively, with long, pulled back headlamps, Datsun’s quintessential hexagonal grille with honeycomb mesh and chrome surrounding.The side profile is highlighted by sharp lines and flared wheel arches, which is largely a segment-first. The rear profile comes with boomerang-shaped tail lights and chrome garnish on the boot lid. The sharp line on the bottom of the side panels that rises up to the tail lights add to its overall look. > As far as cabin space is concerned, this car wouldn’t disappoint you. However, in terms of look, the interior done up in a dark colour scheme is quite dull.The quality of plastic used is not that good, though the cabin promises ample storage space in the form of cup-holder, bottle-holder, cubby holes and door pockets. The dashboard and the centre console hardly manage to impress. The boot space is 222 litres is also not adequate. > Datsun offers three additional body kits on RediGo including Easy Kit Sporty, Easy Kit-premium and Kool Kit. High end trim is accompanied by an audio system with USB, AUX-in radio, FM/AM, CD player and MP3 player. The dominant player in small cars, Maruti had long been the leader in the mass market as it sells one out of every two cars. It has a wide array of both new and old cars which remain hot sellers. Arguably the most important factor in its favour is the cheap price range. Despite India being one of the world’s fastest growing big economies, only a small percentage of its population can afford to buy cars, first-hand or pre-owned. In this scenario, people show confidence in this revered brand, thanks to its wide network of garages and dealerships, which have boosted its reputation in terms of reliability and support, as well as an easy supply of cheap parts. > It is powered by the 0.8litre petrol engine which is capable of churning out 48PS and 69Nm of maximum power and torque respectively. Engineers have used specially coated piston rings which reduce frictional losses and increase engine life and fuel efficiency. The engine is capable of churning out a maximum power of 35.3Kw at 6200rpm. The Alto 800 now comes with a 796cc, 3-cylinder, 12-valve per cylinder MPFI, FC engine with 32-Bit computer. > The engine is mated to a 5-speed manual transmission which channelizes the power to the front wheels of the car. > A new brake booster with claimed improvements in braking performance is another major draw. > The fuel efficiency is rated at 24.7kmpl with the petrol variant and 30.46kmpl with CNG. > It flaunts the new Aero Edge design, with leaner upper grille and larger trapezoidal shaped lower grille. It also features character lines on the bonnet, revamped headlamp cluster, flared wheel arches, etc. > Quality of plastic and materials used inside the cabin is in line with other budget hatchbacks. Centre console gets AC vents, dials for AC and an audio system. There is also an elementary instrument cluster on offer, along with a basic three-spoke steering wheel. Buyers can also expect bottle holders on the rear doors, front power windows, remote keyless entry, co-driver side map pocket, etc. > It delivers improved performance over the previous model, with the engine being more flexible and an impressive fuel economy. It performs fairly well not only within the city but also on highways. > Very basic safety features, with an option for driver side airbag on the entire range. Besides, the hatchback is equipped with central door locking, tubeless tyres, collapsible door locking, front wiper and washer, immobilizer, head light levelling, etc. > As far as braking is concerned, it uses solid disc brakes in the front and drum brakes at rear axle. The hatchback handles better at lower speeds. Though the suspension is somewhat noisy, it does a decent job in stabilizing the car. However, it is not good enough for erratic roads. Datsun Go Plus MPV is the first ever compact MPV from Datsun in India. It comes in a total of four trim levels with a petrol engine under the hood. Go+ is an extended version of the GO hatchback that promises more style, more space, enhanced practicality, and better power. This perfect budget-friendly MPV for families also offer decent engine performance and fuel efficiency. Though it can be used as a 7-seater, but the interior space could have been better, and safety fitments could be improved. However, it still qualifies as one of the best options when it comes to buying used cars under 3 lakhs in Delhi. > It is powered by the same 1.2 litre 3-cylinder petrol engine that is present in the GO hatchback. It develops 67bhp and 104Nm and is mated to a five-speed manual transmission. The car accelerates to 100kmph from standstill in about 15 seconds. > This car has a robust suspension system that helps maintain stability and agility on any road condition. The front axle is paired with a McPherson Strut type of system along with a double pivot lower arm. > The mileage is around 15-20kmpl. > When it comes to driving experience and handling quality, this car scores quite high on open as well as congested roads. The brake performance is decent, thanks to the ventilated discs towards the front and drum at the rear. Both in city traffic and in highways, this car ensures easy drivability, though at high speeds, there is a fair amount of body roll. > The safety equipment include a manual central locking system, three-point seatbelts and an engine immobilizer. > Coming to the exterior, the Datsun Go Plus flaunts a refreshing look front in the front as well as the rear. The front facade sports large hexagonal shaped radiator grille in the centre featuring a perforated mesh. The rear profile is accompanied by a radiant taillight cluster.The side profile too looks impressive owing to the neatly engraved fenders and expressive lines. Further, the exterior can be personalized with aspects such as body graphics, a set of stylish alloy wheels, roof rails and a rear spoiler. > As far as the interior is concerned, you can expect the cockpit with bench seat, and the gearbox console integrated to the dashboard. There are ample legroom and shoulder room for the front occupants. Other features of the cabin include digital tachometer, bench folding of third row seats, and remote operation for the opening of tailgate and fuel lid. There is also a 2-DIN based music system including a CD player and FM radio for enhanced entertainment. 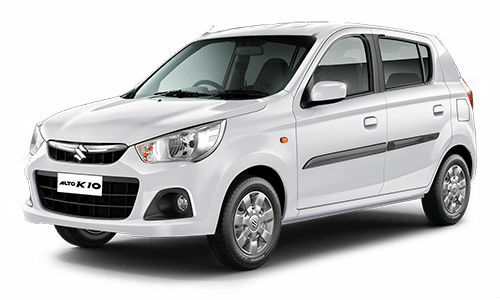 Basically an upmarket version of the country’s largest selling car- the Maruti Suzuki Alto, the Alto K10 boasts of an impressive engine, high fuel efficiency, great drivability, and affordable pricing. The features are quite standard, making it one of the most value-for-money offerings amongst second hand cars in Delhi. > Powered by the 1.0litre three-pot K10B petrol mill, this car churns out 67bhp of power and 90Nm of torque that is sent to the front wheels via a five-sped AMT gearbox, which makes driving a lot easier and hassle-free. The power is more than good enough for a small car. > It promises class-leading mileage, delivering a fuel efficiency of 20.2kmpl on highways and 15-16kmpl in city traffic. > The braking system is very basic, albeit it is quite efficient in providing good control. The front and rear wheels come with ventilated disc brakes and drum brakes, respectively. Being relatively small, the tyres have little role to play in maintain the balance and stability of the car. > The safety features include, seat belts, child lock, front fog lamps, headlights, engine immobilizer, i-CATS, central locking key off reminder, etc. However, the advanced ABS and EBD are missing. > The K10 also offers decent handling and ride quality. The powerful front McPherson Strut suspension with torsion type roll control device and rear coil spring, gas filled shock absorbers with three-link axle, and isolated trailing arm suspension and isolated trailing arm make driving a breeze, even if the roads are busy. > The ground clearance is 160mm, while the minimum turning radius is 4.6m. The low NVH levels make driving an enjoyable experience. > With mild cosmetic changes, the K10 shares close resemblance with its siblings- Maruti Alto and Maruti Zen. Compact from the outside yet quite spacious on the inside, this car flaunts an impressive front fascia, thanks to the new headlights, body-coloured bumper, extended snout and stylish front fog lamps. The badge is significantly highlighted on its front face. The wheels of the top-end variant get full covers, whereas the K10 LXi comes with only a centre cap. The new taillights, tailgate with wedge and rear bumper have retained the car’s aesthetic feel. > As far as comfort and features are concerned, the K10 far outshines its sibling. The ORVMs can be easily adjusted from the inside. The steering wheel is now more stylish but less responsive.The new blue seats come with integrated headrests, though the plastic quality is not up to the mark. Other prominent features of the cabin include, a climate control unit with heater, front power windows, electric trip-meter with tachometer, illumining instrument cluster with speedometer, vanity mirror, sun visor, ash tray, accessory socket, cup holder, rear parcel tray, accessory socket, tinted window glass, etc.